An incident in Wakefield raised many eyebrows when one painting beat all the odds and survived a massive fire. The First Baptist Church of Wakefield was engulfed in flames on Tuesday night. According to a witness, lightning struck the 180-foot steeple, which immediately went up in flames. I ran off my back deck and I could see the church was struck by lightning. All of a sudden it was engulfed in flames and we watched it burn and burn and burn and we heard the shingles cracking and all of a sudden it just exploded out. The historic 150-year-old building was left completely destroyed, which is a big loss for the community. CBS reports that the heat was so intense that it could be felt even a few streets away. Luckily, everyone managed to get out of the church uninjured. In a short time, there was nothing left from the building. Except for one painting that miraculously survived the catastrophe. The large painting of Jesus remained intact after the incident. It was removed from the rubble almost fully unscathed. To a big surprise of people, it had no damage from the fire, smoke, or water. 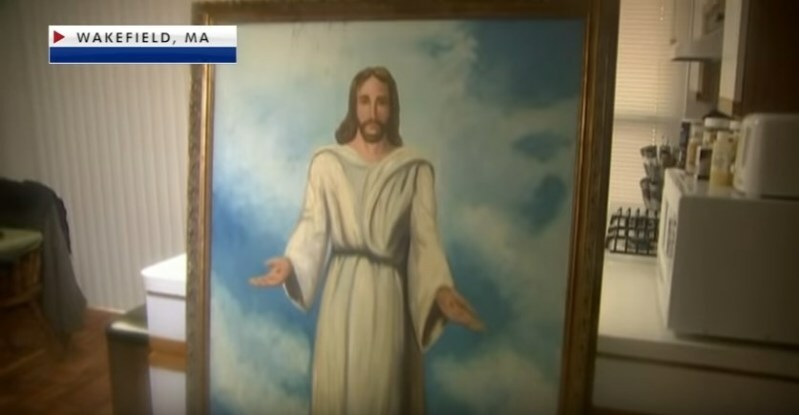 It was reported that the painting will be given to a former pastor of the church. How it survived the fire – no one knows. But people believe it was meant to be saved. God giveth and God taketh away, the Church can be rebuilt, but Jesus is here to stay. It wasn'rant to be in a fire, but it was meant to be saved. Jesus! You are the great I Am!! What do you think about this? Do you have any ideas on how this beautiful work of art remained untouched by the tongues of fire?